38 Restyling & tRuck AccessoRies | FEBRUARY 2015 restylingmag.com REstYlingmAg.com 38 Restyling & tRuck AccessoRies | FEBRUARY 2015 that is enthusiastic and excited to modify their vehicles, not un- sure and fearful based on lack of knowledge or information." 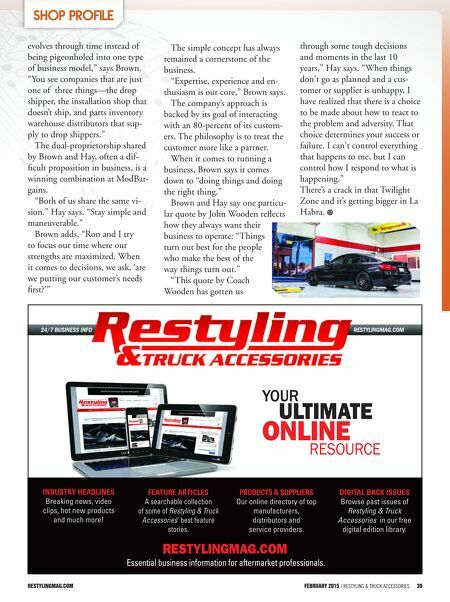 Utilizing multiple marketing methods—some requiring money, others just consistent 'energy', as Brown describes—helps boost the shop's word of mouth popular- ity. With customers, enthusiasts and even employees running in the same circles, word of mouth grows exponentially for the shop. ModBargains' extensive reach in the real world and in the virtual world has helped it to consistently hire the right type of help, and in turn provide the right kind of help for inquiring consumers. 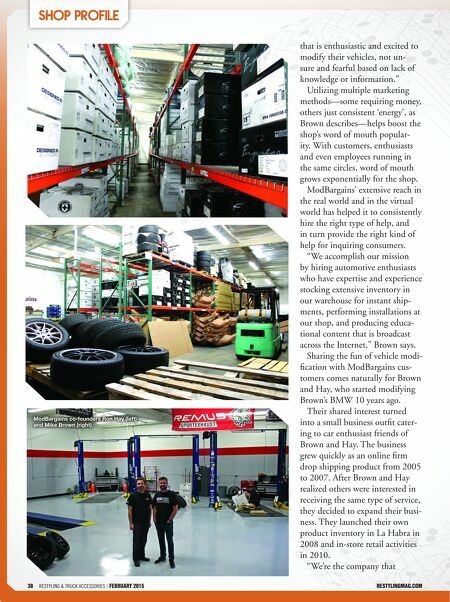 "We accomplish our mission by hiring automotive enthusiasts who have expertise and experience stocking extensive inventory in our warehouse for instant ship- ments, performing installations at our shop, and producing educa- tional content that is broadcast across the Internet," Brown says. Sharing the fun of vehicle modi- fication with ModBargains cus- tomers comes naturally for Brown and Hay, who started modifying Brown's BMW 10 years ago. Their shared interest turned into a small business outfit cater- ing to car enthusiast friends of Brown and Hay. The business grew quickly as an online firm drop shipping product from 2005 to 2007. After Brown and Hay realized others were interested in receiving the same type of service, they decided to expand their busi- ness. They launched their own product inventory in La Habra in 2008 and in-store retail activities in 2010. "We're the company that ModBargains co-founders Ron Hay (left) and Mike Brown (right).